The GeoPro Moble App supports the ability to pair with the GeoPro Alert Button also known as the VSN Mobil V.BTTN. The V.BTTN is a Bluetooth wearable button that can be used to surreptitiously trigger an SOS as well as perform check-ins from the GeoPro Mobile App without having unlock your smartphone. Visit the geoprosolutions.com for additional device details. Note: GeoPro Mobile App v2.4.2 or higher is required for GeoPro Alert Button/V.BTTN support. 2. Enable Bluetooth on your iOS or Android handset by navigating to Settings, followed by Bluetooth. 3. Open the GeoPro Mobile App and select the Devices button. 4. Press the Scan button and the mobile app will begin searching for the V.BTTN. 5. Select your button from the list and the mobile app will begin pairing with the device. 6. 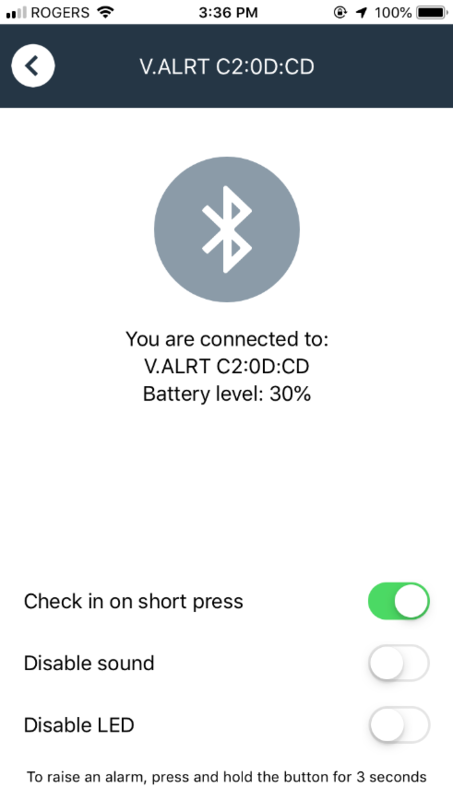 You are connected and the battery level will be displayed once the connection has been established successfully. 7. If you wish to use the alert button for check-ins in addition to being able to declare an SOS, simply enable the Check-in on short press toggle. You can also use the Disable sound and Disable LED toggles for discrete operation, however it is not recommended that both are disabled at the same time. Note: The GeoPro Mobile App will attempt to connect to the V.BTTN automatically each time the application is started, after the initial pairing. If the app fails to connect, press the Connect button on the Devices screen. If the GeoPro Mobile App is force closed, the V.BTTN will indicate the connection has been lost by providing two consecutive audible alerts and flashing red. You'll also receive a notification in the GeoPro Mobile App.